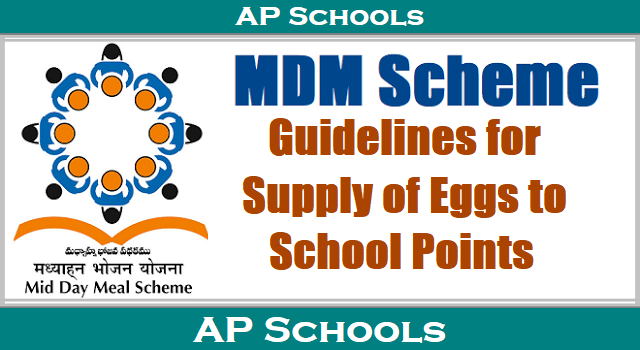 AP MDM: Guidelines for Supply of Eggs to School Points 2017/ Rc.No.100,Dt.27.07.2017 - MDM Supply of Eggs to School Points-Guidelines/ Guidelines for supply and procurement of Eggs to school points in the State: The supply of Eggs to the school points from 01/08/2017 is entrusted to three successful bidders in the State. The district wise suppliers selected have already been intimated. In this context, the following guidelines are issued for strict compliance for Supply of Eggs to School Points 2017. Sub:SE-MDM- Supply of eggs to School Education Department centers Under Mid Day Meal Scheme for the year 2017-18-Guidelines for supply and procurement of Eggs to school points in the State- Reg. 1)Supreme Court order the W.P. (Civil) No. 857 of 2015 with Interlocutory Application No.1 of 2015 filed before the Supreme Court of India by Swaraj Abhiyan Vs UoI and others. 2) Several representations of the Mid Day Meal Workers received through District Educational Officers concerned. 5) GO.Rt.No.3 Dept for WCDA&SCDt:09/01/2017. 6) Lr.Re.No: 100/MDM/2016 Dt: 27/12/20117 along with report of Tender Evaluation Committee. 7) Hon'ble High interim direction in W.P.No: 10807 & 10909 dt:27/03/2017. 9) Tender Evaluation Committee recommendation on 02/06/2017. 12) Rc.No.100/MDM/2016 Dated:29/06/2017 of this Office. In continuation of the reference 12th cited, all the District Educational officers are informed that the supply of Eggs to the school points from 01/08/2017 is entrusted to three successful bidders in the State. The district wise suppliers selected have already been intimated. In this context, the following guidelines are issued for strict compliance. ~ Eggs will start reaching school points from 01/08/2017. ~ The eggs shall be served on the specified days in a week. In case there are any 3 working days in any week, the eggs shall be served on all the days. ~ Necessary instructions should be issued to all the SHGs/NGOs not to purchase the eggs from the open market from 01/08/2017 onwards. ~ The supplier shall supply the eggs as per NECC guidelines with color stamping on the eggs (hen). The Supplier will be supplying the eggs as given below. ~ The egg supplied are stamped as "MOM-AP" for School Education department" in indelible ink. The HMs/SHGs shall verify at the time of delivery. ~ The HM/Teacher should maintain stock register in the school. And obtain the signature in it. ~ The Head Master should acknowledge the eggs in prescribed proformae after obtaining the eggs from the supplier. The same should be counter signed by the concerned MEO. ~ The Eggs (hen) will be delivered in plastic I cotton trays which will be collected by them in the next trip. So that it does not break. If the HM/SHGs found the eggs are broken at the time of delivery, the same should be returned to the supplier and obtain the same quantity. ~ If the eggs are damaged or any other complaints are raised, the Mandal Educational Officer should make a call to the supplier immediately. ~ The monthly indents will be placed by the School Education Department and the supply has to be effected to the destinations specified, every week. ~ Care shall be taken while making indent for requirement of eggs for subsequent weeks keeping in view of the eggs available in a particular week. ~ The HM should ensure the eggs available at the school and to deduct the opening balance of every last week and to obtain the remaining required eggs for that week (proforma encl). ~ The suppliers will deliver the entire stock at the Centralized Kitchen where the NGOs are supplying cooked food except Iskcon, Akshaya Patra & Sri Kalahasti Trust in the State. The District Educational Officer should intimate the location of their Centralized Kitchen to the suppliers without fail. ~ The District Educational Officers are requested to intimate the NGOs that it is not possible to release the additional cooking cost i.e., Rs.2.35 /child as the Department is supplying the Eggs. ~ The District Educational Officers should also inform the same to the SHGs that the additional Cooking cost i.e., Rs.2.35 /child towards Egg will not be paid from 01-08-2017.